Many people have asked me, “How can you afford to travel as much as you do?” The fact is I do a lot of travel for work with my expenses covered, but I also make use of travel tips from my circle of friends and fellow travel writers. Although my bucket list seems endless, high up on that list is Bangkok. That’s why I asked a peer travel writer, Angela Linton, who specializes in luxury travel, to share ways to experience Bangkok in style, but within a budget. As far as affordable travel destinations go, Bangkok is certainly up there. Not many cities that offer great food, fascinating culture, and great sights are considered to be ‘value for money’. It comes as no surprise then to find that Bangkok was the world’s most-visited city last year, overtaking much pricier destinations such as London and Paris. For luxury travel, you can’t go wrong with Bangkok. With so much to see and do, you’ll want to plan the perfect trip to make the most of your time. Get some hints and tips on how to enjoy affordable luxury in Bangkok for a five-star experience you won’t forget. While backpackers might choose the hostel life in Bangkok, for a few extra dollars you can lap it up in luxury at a top of the range hotel. After a long flight, you’ll be wanting to relax, so picking the right accommodation is important. If you prefer to relax in more familiar surroundings, then check out some Bangkok condos you can stay in to take things at your own place. Bangkok is a bustling city, so you’ll appreciate a quiet spot to return to at night after exploring. Bangkok boasts some of the best street food in the world, and there are some must-try dishes to enjoy during your visit. You can eat like a royal on just a few dollars a meal, or you can up your game and enjoy a sit-down meal in one of Bangkok’s luxury restaurants instead. Deck by the River offers some amazing views out over Chao Phraya River, where you’ll be able to see the Wat Arun (Temple of Dawn) in all its glory. Meanwhile, Vertigo is the perfect place to enjoy the sunset, with some of the most amazing rooftop views that Bangkok has to offer. Blend luxury and authentic Thai cuisine to help you get a true flavor of Thai food. The best way to explore Thailand’s capital is with a guide. A personal tour guide can help you get a fuller experience of Bangkok, learning all about its history and sights without jostling around in a crowd of other tourists. Private tours of Bangkok are easy to find, and are excellent value – starting at $60. In addition to the tours, you can also take part in private cooking lessons, carving workshops and more to help you bring some Thai culture back home with you. 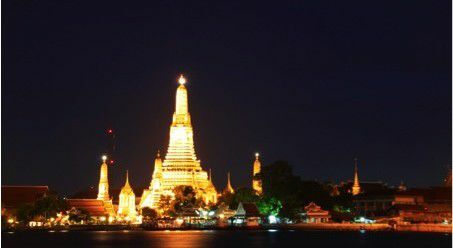 Bangkok is a great city to explore and should definitely form a part of a longer trip to Thailand. You can make your trip a luxury experience without breaking the bank, taking in the best Thailand has to offer and simply enjoying your surroundings. For a vacation to remember, it’s one that should be at the top of your bucket list. Interested in further travel but worried about your finances? Take a look at this handy guide to managing travel on a tight budget.